Bryan Davis at Lost Spirits Distillery has a thing or two to say about that concept though. Here he has carefully crafted a spirit that is more than what most people think about the category of overproof spirits – and possibly even rum in general. The philosophy at Lost Spirits appears to be a fanatical dedication to finding the perfect balance between science and art when it comes to distillation. Previously known for their American Whiskeys, Bryan and his crew set out to start making amazing rum (because really, how do you not fall in love with rum?) and their experience through the looking glass has brought us some true treasures – the latest being a high proof rum inspired by the process used for creating rums in Cuba for over 100 years. However, with some American twists to make it a rum with character and approachability. Lost Spirits produces the rum in their “homemade” pot still, using a mash of fermented molasses. The distillate is then aged using their own patented non-traditional methods, allowing the spirit to more rapidly absorb the appropriate chemical compounds of the wood that give older spirits their appeal without introducing some of the risk of the wood being overused. There’s actually a fascinating write up that goes into great detail about the process over at Cocktail Wonk. So be sure to check that out if you want to get into more of the nitty-gritty details. The bottle of the 151 is one of my favorites from Lost Spirits. It hearkens back to the days of Prohibition with its art deco stylings and tropical travel poster-like imagery. You feel like you may step off of the plane in the picture and end up in La Floradita in Havanna, sitting right next to Papa Hemingway himself. In the glass, the spirit is a lovely amber color. It’s not very dark like the Plantation Overproof or Lemonhart 151, but it’s got enough color to give it character. Fill a glass with the Cuban Inspired and be prepared for it to fill the room. Sitting with a glass of it next to me while putting together my notes, I could smell the rum without ever getting the glass off of the desk. The rum is rich – so much more than just the burning sensation of ethanol that tortures anyone who generally strays into the robust category of overproof rums. Not to say that there isn’t burn. I wouldn’t recommend sticking your nose deep into a glass and inhaling deeply unless you’re trying to teach your nostrils a lesson. But this is no gasoline. Notes of cocoa and bananas mingle with the tinge of heat on the nose, bringing to mind desserts like bananas foster. There’s an undercurrent of toasted marshmallow and caramel as well, all before the heat of the spirit brings to mind tall grasses in humid sunshine. Let’s get the first thing everyone’s wondering out of the way first: yes, it’s hot. You’re drinking something that’s over 75% alcohol by volume, so if you’re drinking it neat, it’s going to bring some fire for your throat – and lips and tongue and pretty much everywhere else. That being said, one could be forgiven for deciding to drink this poured into a snifter all on its own, or possibly straight out of the bottle. Before the heat comes, you can taste Bryan’s hard work with entry notes of marshmallow and toffee. The heat from the alcohol is not far behind – don’t gulp this – but after it washes over you you don’t find yourself left with searing pain. Instead, the finish is clean on the tongue, and in the back of the mouth and throat there are elements of candied orange peel and toasted banana. That’s if you go neat. Of course, with so much heat, most people – if they aren’t mixing – will probably want to throw in an ice cube, and introducing ice to this rum creates impressive change. There’s still a richness, but the tamed heat exposes the oily body of the spirit along with the grassier elements that are hinted at in the flash from rich to hot. Greener notes of straw combine with chocolate and raisins, leaving you with something reminiscent of leather on the finish. This may be one of the few (only?) rums over 60% ABV that you’d sip neat, but that doesn’t mean it’s the only way to drink it. The qualities of this rum open it up to a lot of various uses. It lacks the blackstrap qualities of something like a Lemonhart 151, but it is a great go-to for any Tiki drink calling for some heft. Use this in your Zombie and you will not be unhappy. You can also up the octane on other cocktails and come away satisfied. Throw this in a daiquiri and try to keep to your two drink maximum. I’ve also used it in Three Dots & A Dash (in place of the Demerara), as well as as an additive to a Mai Tai from time to time. I’ve even tried it as the rum in the Jon Hamm’s Briefcase and was pretty darned pleased with myself (and asleep 20 minutes later). Of course, when in doubt with a 151, float it on top of a forgiving cocktail. Bryan Davis, flat out, is just one of the super-stars of Mad Scientist Distillation. He has the knowledge and passion to try to do new things without throwing out the centuries of knowledge that has come down to him. Whereas, there are other small-batch distilleries and breweries who can be just as fearless, it’s rare that they combine that fearlessness with the same desire to create something that is nearly universally approachable – even in a complicated and complex category – as Lost Spirits has proven to be. 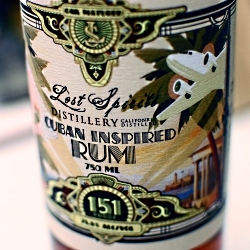 My one hope is that Lost Spirits continues to produce their rum up on the Central Coast of California for a long time to come – because this may be the best 151 rum on the market today. It`s a damn good rum! (just like the other rums from Lost Spirits Distillery) and easy to sip neat and that makes it dangerous rum….i suggest using it as float or with other rums due to it`s strength 🙂 and i think it makes fabulous daiquiris!